I’m delighted to let you know that I now have brand new covers for all my books. I’m really pleased with them and would love to know what you think. This entry was posted in Blog, Dead Dry Heart, Happy Travels 101, Holy Spear of Magus, Jotham Fletcher Series, Self Publishing, The Magus Covenant, The Magus Epiphany, The One Way Diet, The Rock of Magus and tagged author life, book covers, thrillers on November 14, 2018 by Toni Pike. This entry was posted in Blog, Happy Travels 101, Travel and tagged Iceland, travel on September 23, 2018 by Toni Pike. This entry was posted in Blog, Happy Travels 101, Healthy Living, Jotham Fletcher Series, Lifestyle, The One Way Diet, Travel and tagged cruise, dreams, health, inspiration, life, Lifestyle, New Years Resolutions, novel, weight loss, writing on December 27, 2017 by Toni Pike. This entry was posted in Blog, Happy Travels 101, Jotham Fletcher Series, Travel and tagged cruise, Instagram, Lifestyle, travel guide, travel insurance, travel photography, travel safety, travel tips on September 27, 2017 by Toni Pike. Sue Loncaric from the Sizzling Towards Sixty & Beyond blog, is preparing for an exciting trip to Spain and other parts of Europe. She reflects on her preparations, and talks about some inspiring tips that she’s received from fellow bloggers and writers. This entry was posted in Blog, Happy Travels 101, Lifestyle, Travel and tagged #travel #traveltips #travelblogger on September 18, 2017 by Toni Pike. 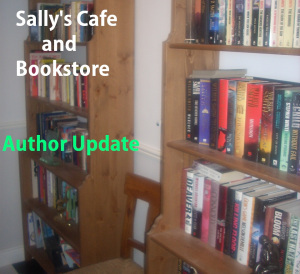 I was thrilled to appear in Sally’s Cafe and Bookstore Update today, along with great authors Charles E. Yallowitz and the amazing Sally Cronin. Welcome to the Friday edition of the Cafe and Bookstore author update and two authors today have new releases. First is Toni Pike with a travel guide for those of us who are keen to head out on adventures to experience new cultures. Happy Travels 101: Cruise, flight and sightseeing tips to enhance your journey. Discover my travel booking tips, my suggestions for exploring any destination, my tips for escorted tours, and my travel packing guide. Find out how to select and make the most of your next cruise, how to cope with a long-haul flight, and how to prepare a travel preparation checklist. And don’t miss my recommendations on travel safety, senior travel, and travel photography. This entry was posted in Blog, Happy Travels 101, Jotham Fletcher Series, Sally's Cafe and Bookstore, The Magus Covenant, The Magus Epiphany, The Rock of Magus and tagged Author, author update, Sally's Cafe on May 11, 2017 by Toni Pike. I’m excited to announce that my new book – a travel guide – has just been released. 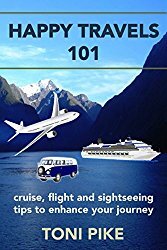 Happy Travels 101: Don’t leave home without these cruise, flight, safety, packing and sightseeing tips is now available exclusively on Amazon – including Kindle Unlimited. This entry was posted in Blog, Happy Travels 101, Travel and tagged cruises, flights, senior travel, tours, travel, travel guide, travel tips on May 9, 2017 by Toni Pike.